This is Versailles: Welcome to Versailles! This blog is dedicated to the L'ancien Régime or Ancient Regime of the French monarchy before the revolution. Take a tour around the royal family's residences at Home of Kings, read about the Kings, Queens and nobility and the strict etiquette that dominated Versailles. If you have a taste for architecture take a look at A Palace is Created for some of the original drawings for what is now Versailles. Remember, this page is constantly being updated so remember to check back soon to find out more about the most extravagant court the world has ever seen. Having trouble finding your way around? Here is a quick description of the specific topics. You must be as obsessed as I am with 18th Century as I am and much more organized to have put together such a fantastic blog. Very impressive! I will be back to read your posts often. I've been looking at your blog some more and am amazed at how thorough and complete it is! I'd like to email a question to you, but don't see your email address on the blog…. A fascinating and very thorough blog which must have taken ages to research and design. Very obviously a labour of love! Thank You so much! I really do love all the photos and floorplans! Especially those of The Petit Trianon. Good job! A fabulous blog!! I love it! Been browsing your blog. Love it! Hello, I love looking at floor plans of castles and palaces and am obsessed with them especially Versailles. 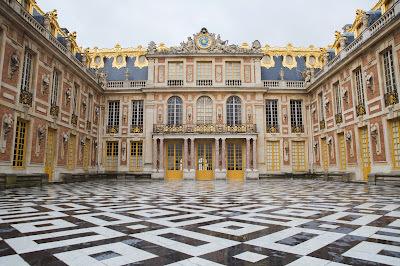 I have had a question for many years about Versailles that you might be able to answer. Do you know how people would have got from the first floor to the hall of mirrors on the second floor? Which stair case they would have used and which rooms they would have walked through to get the the hall of mirrors? There doesn't seem to be anyway to get there without walking through the rooms of the king and queens apartments. Do you know anything about this topic? Thank you! Hi and thank you so much ! The most prominent courtiers had their own apartments within the château where especially the north wing was dedicated to this purpose while the south wing was mainly reserved for princes. Other courtiers were lodged underneath the roof in tiny, cramped apartments while others rented houses in the village of Versailles or - more popularly - Paris. Remember, that the courtiers only performed the duties that would involve direct contact with the King whereas the everyday tasks would be left to a smaller army of servants. Hi i am incredibly amazed with your blog! Thank you very much. I was wondering if you could point me towards a better understanding of how the ranks inside the court were established and how this was represented in objects, for example i understand that depending on the rank each person had to sit in a type of chair, but i haven't found pictures of these chairs, or pictures of how the apartments differed from one noble to another depending on their rank. I hope you can enlighten me on this matter, for everything else your blog has been incredible to read :) thank you! What a fabulous blog! So much to discover here. Is there a particular right of entry you are looking for? If so is it an exact list of courtiers you seek? Indeed, certain courtiers - depending on their rank - was only entitled to having one door opened while others had both. Amazing! Thank you so so much! I´m a fashion design student and this has helped me so much, and you will of course be credited. Keep up the good work! Blessings! I am so glad I found your blog. It's amazing. Really good work you've done. I have a question for you, I apologies if you've already given the answer, but I can't seem to find it.So, my question is if you know which rooms/apartment Madame Montespan lived in? Could you please mark it on the construction plan? I have made a new post about her apartment which you can find under "The Apartments"
I am a writer with LiveScience.com, a web magazine based in the US. I am working on a piece about the history and architecture of Versailles and would like to ask you a few questions about it. I would, of course, link to your blog. Please let me know what you think and if you have any questions. You can email me at jessieszalay@gmail.com. Can you tell me if there are pictures of the billiard cue/mace, used bij Marie Antoinette? Please help me, for I'm looking for that special picture. Many thanks for all the time and energy you have invested in publishing this wonderful site! The quality and quantity of information here is quite astonishing. I've just discovered your blog! It is fantastic! Thank you for all this amazing information! Fantastic blog. As a versailles tour provider my hope is that all my guides can show the castle with the same clarity and passion as your comes through in your articles and even more so excellent photography. Do you have a section on your blog which talks about the porcelain sets, jeweled objects and paintings from Versailles that ended up in the Wallace Collection in London and how they got there? It's just an interest. I really enjoy going to the Wallace Collection and last summer went to take a look at the chateau de Bagatelle. It's just an interesting London/Paris connection and the collection of French art and objects is stunning and I find odd because I woudl expect it to be in Paris and not London. Do you do tours yourself or do you stick to writing? I love this blog. There is so much information in this blog that I didn't know about. I have read many, many books and have seen several shows, but nothing compares to what I have learned here. Very interesting and accurate information! Keep up the good work! I am hoping to visit Versailles within a year for my first time. I live in the US. Thank you! I've lived for Versailles and Louis XIV since around the time I was in the third grade! What interests me most at the moment are the specifics of his parties and those of the later Louis'. Do you know where I can find specific details, activities of those? Also do you know of a place I could look at pictures of baroque haute cuisine; I saw the photos from Vatel, the movie, and that dinner hosted there a couple years ago served as it would be to Louis XIV. Love the blog! Thanks for an absolutely fabulous site! I'm curious to know more about the hygien of the time. Like, how did the women at court deal with their periods? :O They didn't have any underwear! Also, Did they have makeup on their eyes, like some kind of mascara and/or on their eyelids? Mange tak! I will upload a post on periods since you got me thinking of it and I think it could be interesting. I will upload it under "Hygiene and facilities" as soon as possible. Love all the info! Where abouts now is the bath/pool that Montespan and Louis IV used together? Hi! I love your blog and I've learned so much! Thanks for all the time and effort you put into it! I have a question. I've been researching the children of Louis XIV and Madame de Montespan and I came upon Madame de Pompadour. Is there a reason Louis XV never had any children with Madame de Pompadour or Marie Anne de Mailly, Duchesse de Châteauroux? Thank you, I am really glad to hear that! Well, Madame de Pompadour suffered at least three miscarriages by the king; the last one in 1749 which was also the year when they allegedly stopped sharing a bed. As for Madame de Châteauroux that is a bit trickier. It may simply be that they just never conceived. Louis XV's fertility was well demonstrated in his many children by the queen but Madame de Châteauroux never had any children by either the king or her husband - perhaps she couldn't. Thanks so much! I never knew that, that's so interesting! On a completely unrelated note, is there a reason some royal couples continued to have children and others didn't? I.e. Louis Ferdinand and Maria Joseph had 13, right up until his death, while Louis XIV and Maria Theresa and Louis XVI and Marie Antoinette stopped after only a few children. I am looking at the seating arrangements from the wedding dinner for Marie Antoinette and Louis. On one of the most favoured places, are written one word, Madame. As far as I know, there were no Madame at Versailles in 1770, the nearest would have been Adelaide, but she is there on the other side of the table. Who is this Madame? I reckon it can not be Madame de Barry..? Would that be allowed, even for a king? I believe it is the wife of the Duc d'Orléans. He had married his mistress, Madame de Montesson, but Louis XV refused to grant her the title of Duchesse d'Orléans. Good afternoon, Louise! My name is Tatiana, I'm from Ukraine. I am delighted with your blog, there is so much information here! I am fond of the period of Louis XIV and in instagram I have a blog dedicated to him - @leroilouisXIV. But there are more illustrations, and you have a lot of interesting information. Tell me, do you know which courtiers had the right to live in Versailles? What positions should they hold? And is there somewhere on the Internet a table of ranks of the 17th century? I would like to know about the positions and responsibilities at the court of the king and queen. Thank you again for your blog! Hi Tatiana! Those who were entitled to an apartment were employed in the households of someone in the royal family - primarily the king and queen. Others could be granted one out of favour. There is a table of ranks under "Ranks: Key to the Court" and I have some of the positions under "the Households"
Were the King's meals watched publicly like dinner with the Grand Couvert? What was the difference between this meal and breakfast and lunch? Do you know if Marie Therese Charlotte ever got to see Versailles again after she was released from the temple?